Nepali tradition and modern comfort meet at Traditional Comfort. As soon as you enter the red-brick building you will notice the perfect balance between traditional artistic features and comfortable modern hospitality. Traditional Comfort follows the Newari design and architectural principles. The Newar people of the Kathmandu Valley are said to have been the originators of the distinctive pagoda style of temple architecture, which later spread throughout East Asia. The unique brickwork and woodcarving are commonly seen in Newar buildings—including the modern Traditional Comfort—is rarely seen outside of Nepal. With a very unique and characteristic culture, Tharu is indigenous to the Terai region where a tiny, but a beautiful village, Barauli stands proudly with its centuries-old tradition, arts, and crafts. Their well-preserved authentic lifestyle makes Barauli a utopia of living history, culture, music, and green vegetation. Traditionally built huts in the Tharu Community Homestay offer an accommodation service in the local settlement, close to the local families, for the authentic local experience. It is also an opportunity to blend yourself with the typical lifestyle of a local Nepali family. The evergreen, beautiful, cherishing smiles of the local settlers are a humble invitation for the rest of the world to explore their elegant lifestyles, traditional values, and culture. Rooms are all well equipped with en-suite bathroom. Rooms are traditionally decorated to exhibit the finest taste of Tharu's history, art, and culture. Nestled within 10 acres of exquisitely landscaped grounds, Hotel Himalaya, conveniently located in 8 km away from the Tribhuvan International Airport and only 2 km from the Kathmandu city centre. Hotel Himalaya has always been an ideal haven for business and leisure travellers alike, offering resort ambience with an intimate touch. Since many of the distinguished NGO’s and INGO’s in Kathmandu are in the vicinity and the UN head office is only a few minutes walking distance. Hotel Himalaya provides a perfect place for our valued guests to rest, work or socialize. The quaint riverside setting offers a magical view from all of the rooms and villas. The Rapti Villas, each with a plunge pool offer a close to nature experience while the Meghauli Rooms with generous balconies provide a perch point for unhindered views of the forest landscape. The walls are adorned with floor to ceiling sketches depicting the daily life of Tharu villagers. The guest areas include the arrival lounge, library, dining room, bar, the Rapti bank deck and the swimming pool overlooking the river. Apart from the magnificent Rhino, the park is a bird watcher’s delight with a count of around 600 including indigenous and migrant species such as the spectacular Great Hornbill, Ruddy Shelduck, Pied Kingfisher, Red-headed Trogon and the endangered Bengal florican to name a few. With the active involvement of the local community, the conservation efforts in Chitwan are a success story. Nestling close by Fewa Lake in the Pokhara Valley, Temple Tree is framed by the foothills and majestic peaks of the Annapurna Mountain Range. The air here is pure and clean, and the sub-tropical climate warm and pleasant. 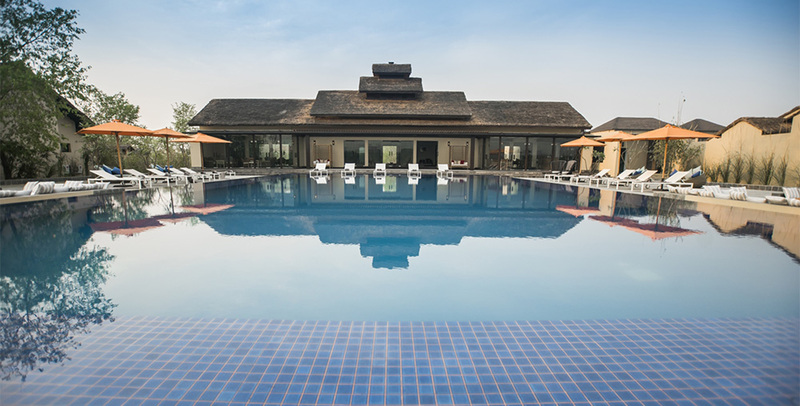 Temple Tree Resort & Spa is a boutique hotel combining western standards with the distinctive architecture and culture of Nepal’s Western Himalayas. Named after the fragrant temple tree plant frangipani found here, we offer a peaceful and relaxed atmosphere, privacy when preferred and attentive service. THAGU CHHEN is built with reclaimed handmade bricks and incorporating original woodworks that are centuries old. Each nook and corner of the apartment suites are filled with artefacts made using local craftsmanship and using local materials that support local industry and employment. In traditional local Newa Bhaye or Newa dialect, “THAGU” means “Thy own” and “CHHEN” means “Home”. So, THAGU CHHEN means “Thy own home” in Newa Bhaye. Moreover, “Atithi Devo Bhavah” meaning “The guest is God” is a part of the code of conduct of our Hindu Society. So, at THAGU CHHEN, an emphasis is given on a level of personalized service and attention to detail that is par excellence. Situated amidst the lush green forest of Nagarkot hill, Hotel Mystic Mountain is an exquisite resort built using ultra-modern design and world-class comfort in mind. The resort consists of 70 rooms in total, which includes 2 duplex executive suites, 3 suites, and 1 big family room. All the rooms in Hotel Mystic Mountain are created keeping the nature closer. Conveniently located on Pokhara’s prominent place “Lakeside”, Hotel Barahi boasts some stunning views of the Annapurna & Machapuchare Himalayans, Phewa Lake as well as easy access to the thriving lake street. Hotel Barahi is 3 KMS away from Pokhara domestic airport, and it offers 85 deluxe and suite rooms, fusion fine dining restaurant with every evening authentic live cultural dance show, cake shop, swimming pool, public bar, meeting rooms, and SPA decorated with comfort and elegance in mind. Rama Inn Boutique Home, a cosy comfort is a boutique hotel of Nepali cultural concept of an international standard. You can find Rama Inn Boutique Home as an example of amusing stay of luxury accommodation. A tourist entrepreneur who spent many years in Tourism industry comes with the conclusion of Rama Inn Boutique Home for the best accommodation service in the heart of Kathmandu city, which lies at the crossroad of ancient civilization of Asia having more than 130 important monument including several places of pilgrimages for Hindus and Buddhists with the seven UNESCO World Heritage Sites within valley. Khwapa Chhen ideally placed on the south side of the main entrance gate to the Bhaktapur and overlooking the Bhaktapur Durbar Square (LAYAKU) or entire Bhaktapur city. Khwapa Chhen or Bhaktapur Home is established with a fundamental idea of providing good food, budget accommodation and a good view. It comes with 12 rooms Guest House and a Rooftop Restaurant. A team of qualified cooks and attentive staff will provide wholesome food whilst you enjoy all that happens in the Durbar Square. Hotel Country Villa is strategically placed on the top of Nagarkot hill, thus offering the best view of the spectacular show upfront. It encapsulates all the elements that set Nagarkot apart. It showcases nature at her best, and thereby catapults its dwellers to the romantic self and promises of a splendid stay. It is only 28 km from the international airport. The hotel area is vastly spacious; it is spread on 2.51-acre land. It is situated at 7,200 feet from the sea level. Here, you float with the clouds and can give audience to the drama unfolding the spectacle of the sunrise and the sunset from very close. Sapana Village Resort offers many different activities and excursions so a guest can experience the local culture and beautiful nature. Experienced guides are specialized in educational expeditions and will gladly inform a guest about the flora and fauna they will encounter during the expeditions. Other activities include an introduction to the Tharu and Chepang culture through a trek into the mountains. From the location of the resort, a guest can also visit many touristic hotspots such as Kathmandu, Bhaktapur and Pokhara, Lumbini and Bandipur. 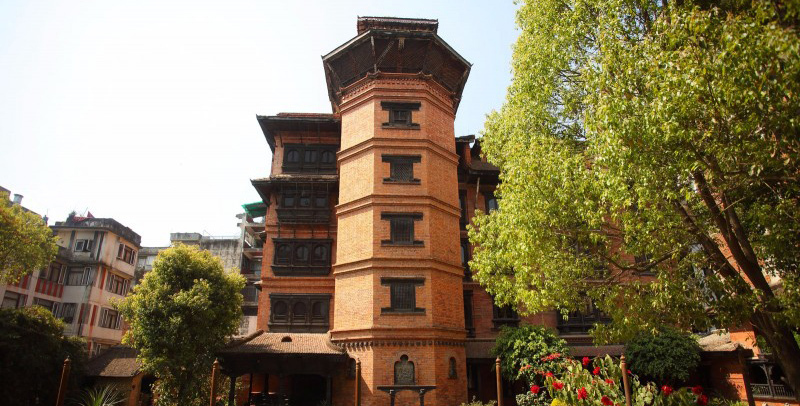 Kantipur Temple House is one of the finest eco-friendly boutique hotels in Kathmandu. It provides authentic Nepalese architecture, decor, food and hospitality. We have forty rooms, ample dining and meeting areas, landscaped gardens and patios. The rooftop terrace has panoramic views of Kathmandu and the surrounding hills. For nearly two decades our experienced, multilingual staff have welcomed many travellers. They range from tour groups to business travellers. All have enjoyed an environmentally friendly and socially responsible setting without sacrificing comfort. A guest who wants to enjoy the sights and sounds of Bhaktapur, renowned for its exquisite art and architecture, centuries-old palaces and monuments, colorful festivals and dances, and vibrant Newar culture, and looking for the valuable insight into the lives of its people, then Bhadgaon Guest House is the place that you want to stay in. It’s a great place to use as a base from where you can explore the city at your own place. Barahi Jungle Lodge situated in the Pacific Chitwan reflects the serenity of the National Park. 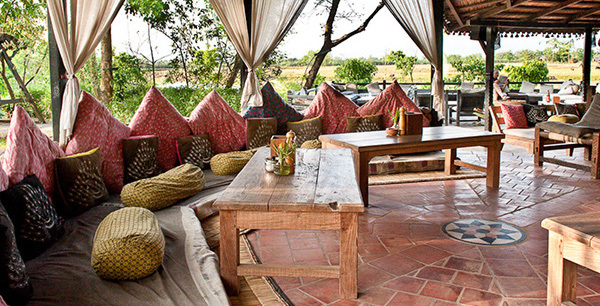 Chitwan’s tranquillity and the lodge’s peace very well complement one another. Experiencing refined luxury in the panoramic jungles adorned with the Rapti River when viewed from Barahi’s vantage point is a parallel universe retreat. We take immense pride in strengthening the bond of nature and mankind through our experiences. Hotel Utsab Himalaya is conveniently located in a quiet spot hidden away from the busy traffic and the stores of Lakeside, but close to all Pokhara’s amenities. Set amongst a mixture of local residences and small guesthouse, the hotel offers breathtaking and sensational views of the Annapurna Mountains from its upper viewing platform with affordable accommodation at its best. It's an ideal place to spend a relaxing night after a long trek, or during a visit to Pokhara. The main highlights of the Utsab are the main lobby and entrance, which has got such profound traditional boutique architecture and handcrafted wooden doors which gives and historic Nepali feel. With 28 years of excellence, Fuji Hotel in Kathmandu is popular for comfort, cleanliness, modern amenities, and our friendly, professional staff. Fuji is a family-run hotel, you can truly feel at home when you are here: it is your home away from your home. Fuji is located in the very convenient, popular area of Thamel in Kathmandu. You are minutes away from cultural heritage sites, Buddhist shrines, shops, night-life and restaurants when you are here. The front desk staff are very happy to help you plan a scenic walk. Atithi Resort and Spa is an unique resort seated at the heart of the city of lakes, Pokhara. ‘Atithi’ is ‘Guest’ in English typically chosen to reflect the well nurtured Nepalese culture of revering ‘atithi-guest’ as cites the verse in Sanskrit ‘अतिथि देवो भवः (Guest is God). The affectionate snow mountains, the lush green forests in the neighboring hills, cool air, clear sky, the calm lake water and the tranquil environment in Atithi will keep you fresh and energetic as you stand close to the scenic canvas of the beautiful Annapurna Himalayan Range. Atithi is richly furnished with the modern architecture and amenities. The beautiful wild rosewood furniture, well designed swimming pool along with rejuvenating spa, private Jacuzzi and sauna rooms have carved a niche of luxury in it. Built in the traditional Nepali Pagoda style using locally available materials, Hotel Vajra is bedecked inside and out with wood and terracotta carvings, stone and marble tiles, hanging brick gardens and traditional Tibetan ceiling-paintings. The hotel has an art gallery, a classical dance studio with weekly performances, an East-West library, an ayurvedic massage room and several roof tops from where one can get a good view of Swayambhunath Stupa as well as dawn and sunset panoramas. The Pagoda Bar, the Pagoda Hall for meditation or yoga, the Naga Theater with yearly drama performances by Studio 7 and a cluster of fower trailed gardens are other attractions. Among the two Heritage Awards awarded to Nepal, one is for the medieval city of Bhaktapur and the other is for Dwarika’s Hotel. Intricately carved wood and terracotta work that adorn the hotel building have been made by some of the best craftsmen in Nepal, and are the highlights of the hotel. The original woodwork pieces are all centuries old and every brick is handmade. Dwarika’s Hotel is also renowned for its aura of intimate luxury and service that refects the hospitable spirit of the Nepali people. With 51 beautiful meeting rooms with all the modern amenities, two dining spaces, with terrace dining experience, a beautiful garden and spa, Mount Kailash provides extensive conference and banquet spaces to provide an ideal venue for larger events and meetings. The bar is a great place to chill out, whether you are in Pokhara for business or pleasure, this modern social venue attracts not only hotel guests but also local shoppers, business people and clubbers. Experience an ultimate balance of modern and close to nature feel by staying in our rooms that provide guests with magnificent views of mountain ranges. Travelers know that the frenetic pace of a crowded city like Kathmandu needs an escape. The Kathmandu Guest House, a converted Rana dynasty mansion with fragrant gardens and airy corridors, has provided the peaceful refuge of choice since 1967. Since the days of being the first and only hotel in Thamel, the packed tourist district of Kathmandu, it’s become something of an institution. It’s close to everywhere and its gate is the meeting point that nobody can mistake. As a guidebook puts it, “Kathmandu Guest House acts as a magnet for mountaineers, pop stars, actors and eccentric characters.” Even The Beatles stayed here in 1968. 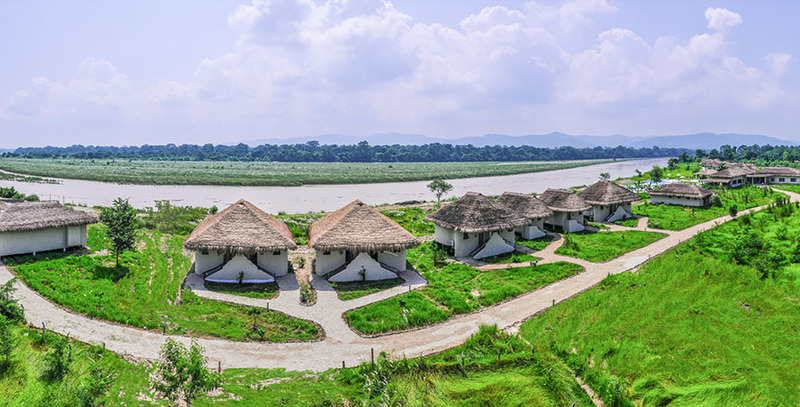 Spread across 8 acres, the cottages stand on short stilts affording excellent views of the surrounding greenery on the banks of a river that separates the property from the expanse of the Chitwan National Park. 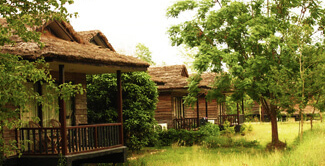 Tigerland Safari is proud of its Ecological Initiatives which includes natural setting and use of local materials that blend with the environment, construction and design inspired by local culture and themes, minimum footprint on the environment by building individual rooms on stilts and the use of solar power as the primary source of energy.